On November 5, October Class and Component prices were announced. The Class III price stayed excellent at $23.82/cwt., near record high levels. 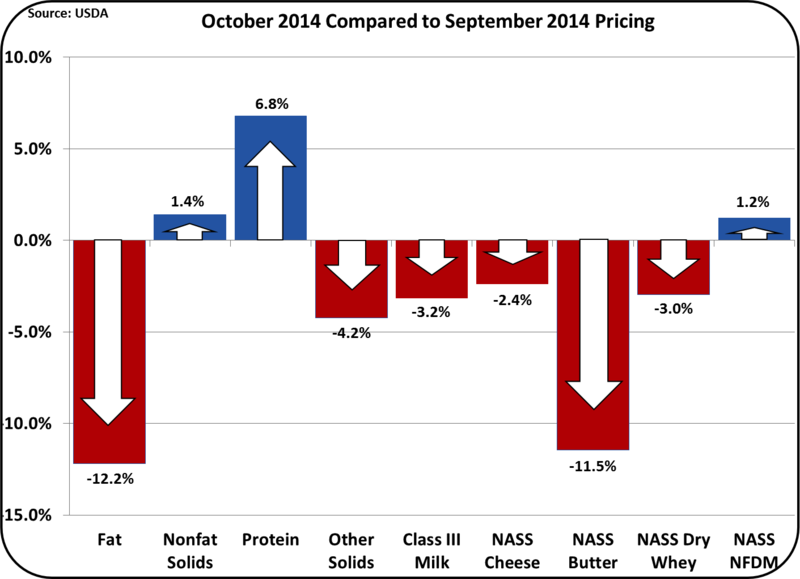 Butter and butterfat dropped by 12% from the prior month. 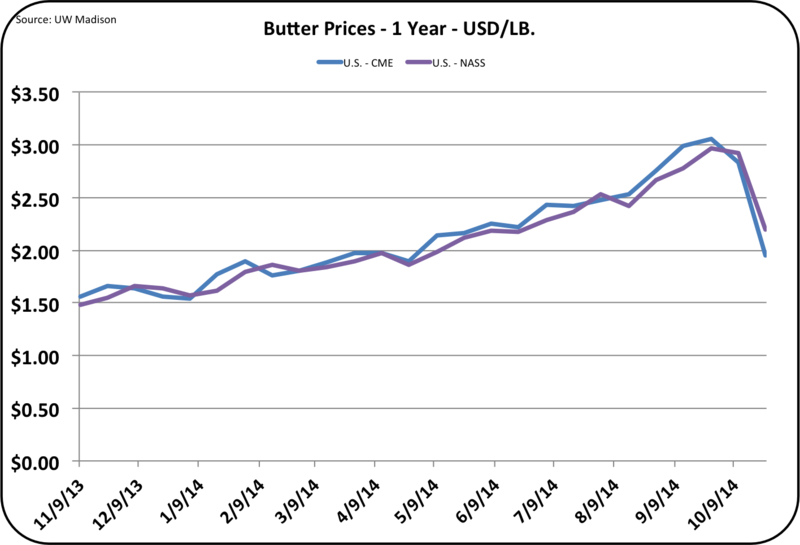 Based on the weekly NASS and CME price trends, butter and butterfat will continue to drop. The most important commodity for milk pricing is cheese, which fell only slightly to $2.29/lb. Milk protein increased by 6.8% due to the drop in price for butter. For an explanation of this relationship, see the August 8, 2010 post to this blog. The current component prices have shifted to more closely match the long-term trends. Milk Protein is continuing its trend of increasing value. 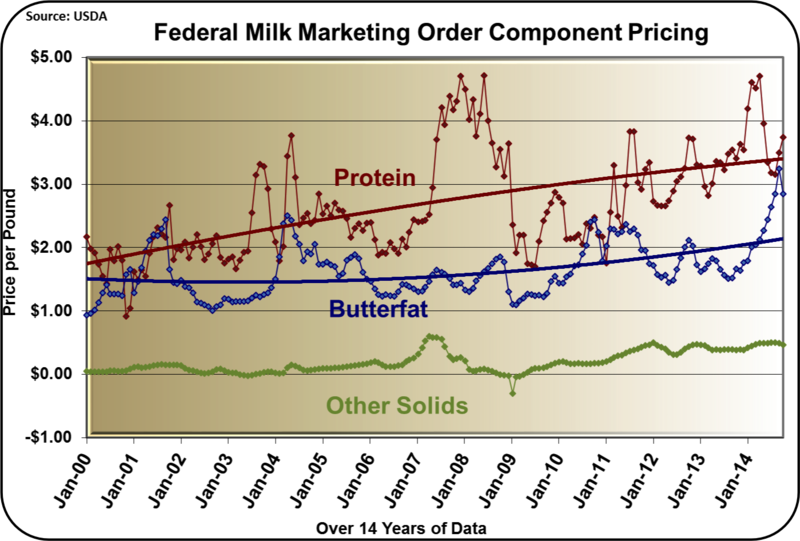 Butterfat prices fell and will continue to fall as explained below. As butter prices continue to fall, and cheese prices remain stable, the value of milk protein will continue to increase. The drop in butterfat prices and the corresponding increase in milk protein prices have started to return the pie of component values to a more normal split with protein contributing the most. Pricing for "Other Solids" remains stable, contributing $2.66/cwt. to the Class III price. Exports have played a major role in the October changes. The U.S. is exporting less as the international market gets more competitive and the USD strengthens. More details on exports are covered below. Butter stocks remained tight at the end of September, which is the most current data available. 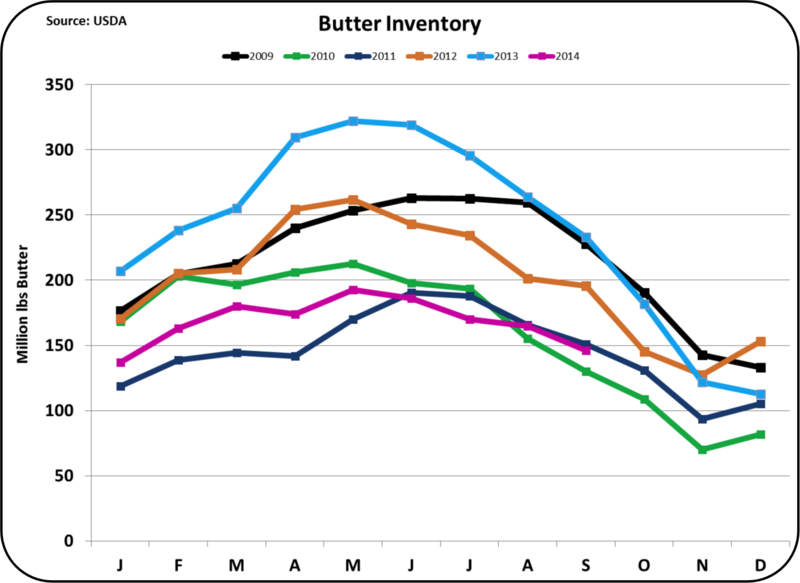 For months, there has been very little butter traded as most all butter inventories are being used to fulfill contract commitments. What has been available for sale has gone at extremely high prices. The fall in the price of butter has dropped every week in October. Butter prices on the CME fell from $3.09/lb. for week of September 25 to $1.95/lb. just four weeks later. The CME prices reflects the very thinly traded exchanges of butter available at auction. The NASS butter value is based on a broader survey of butter sales and in times of butter shortages is less volatile. The chart below shows the weekly NASS and CME butter prices. The October NASS butter prices used for milk pricing reflect a monthly average of the declining prices which includes the higher prices in early October. Because of this, November NASS butter values will certainly show more deterioration in prices. Butter exports fell significantly in September as the U.S. was priced well above the EU and Oceania. 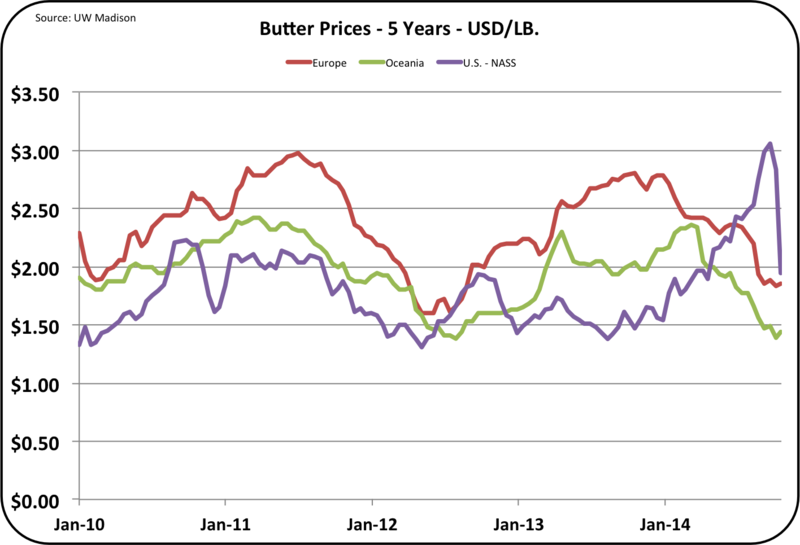 The chart below shows the 2014 spike in U.S. butter prices compared to other exporting regions of the world. In October, the U.S. prices fell significantly, but will have to fall further to be price competitive in the international market. Cheese prices, inventories, exports and production are all staying in good balance. 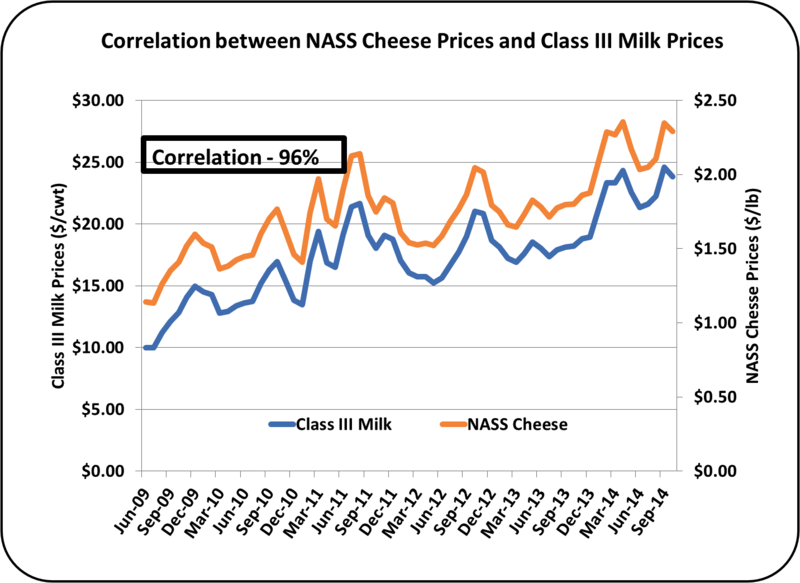 Cheese prices are tightly linked to the Class III milk price as shown in the chart below. Class III milk is the largest of the four Classes and also controls the second largest category, Class I. Therefore, the cheese prices are extremely important to overall milk pricing. As long as cheese prices are good, Class III milk prices will be good. 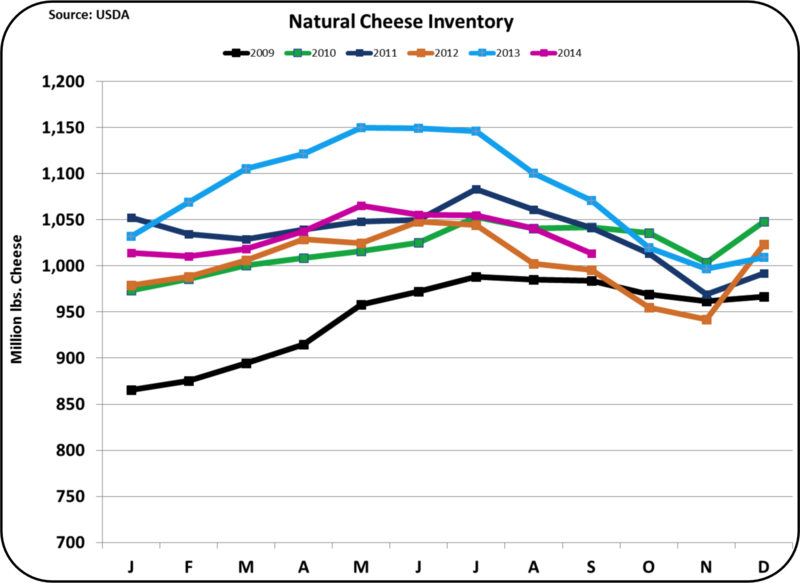 Cheese inventories are in line; not too high, but at reasonable to slightly low levels, which should make for stable operations and pricing. 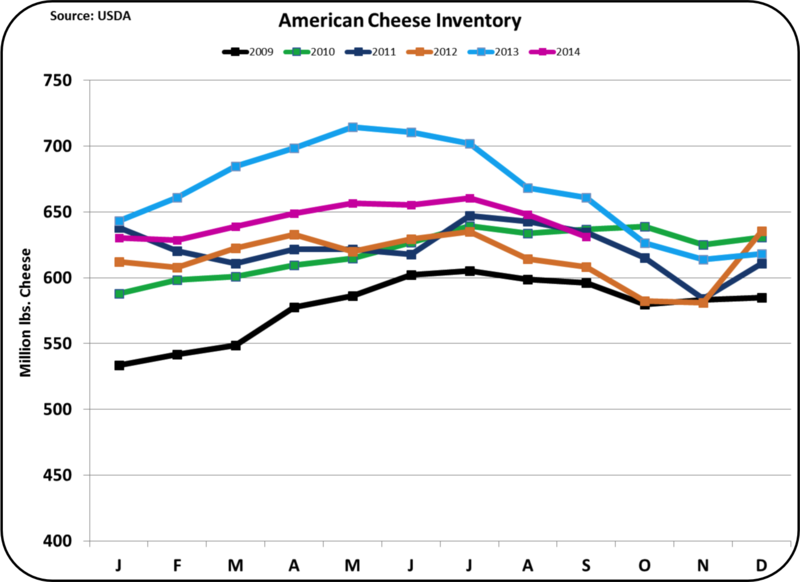 As long as inventories do not rise, the price for cheese will remain close to where it is now. 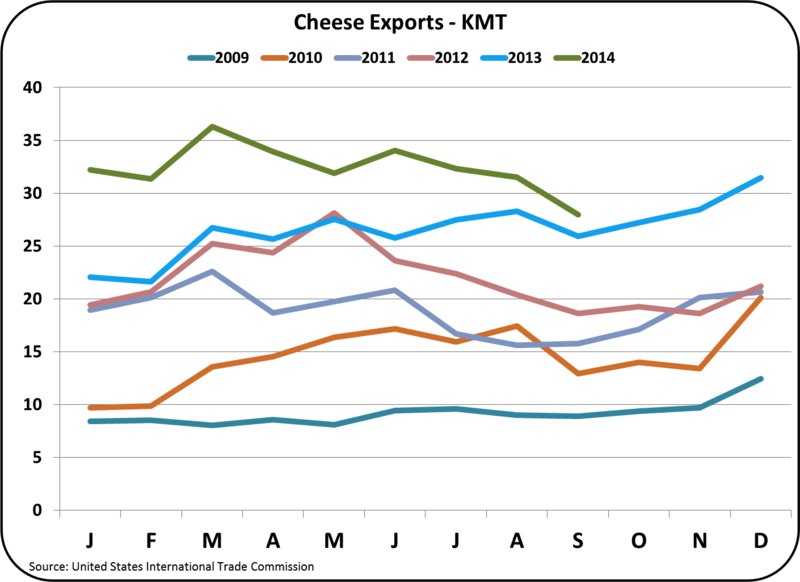 Monthly cheese exports through September are all monthly record highs. However, beginning in April, the increase over prior year has gotten smaller and smaller. Over 50% of U.S. cheese exports go to Mexico, Japan, and Korea. The exports to Mexico are long standing and familiar brands are important to the tourist trade. Japan and Korea are actually closer to New Zealand and sales to these countries could be at least partially in jeopardy. These exports will be followed in future posts to this blog. 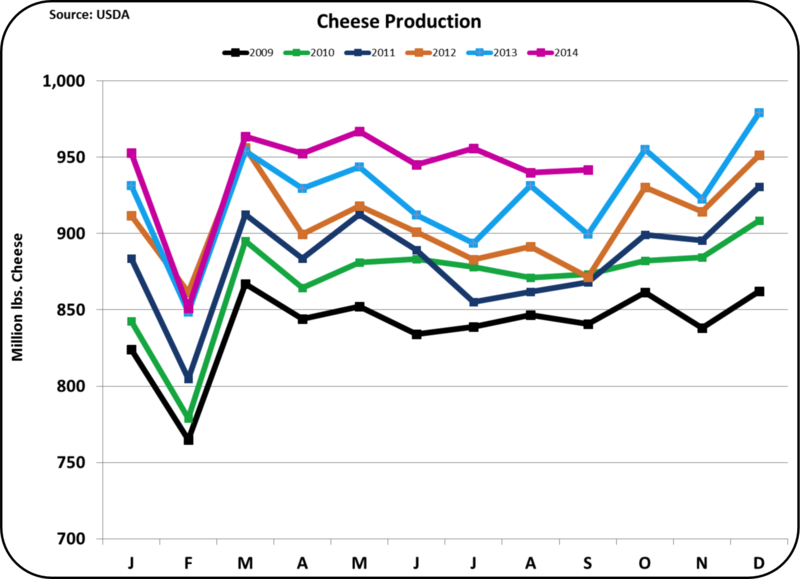 Cheese production has risen to meet domestic and export demand in a controlled manner. This has helped keep inventories in line. A concerning element is exchange rates. As the USD gets stronger, U.S. dairy products become more expensive vs. the global competitors. 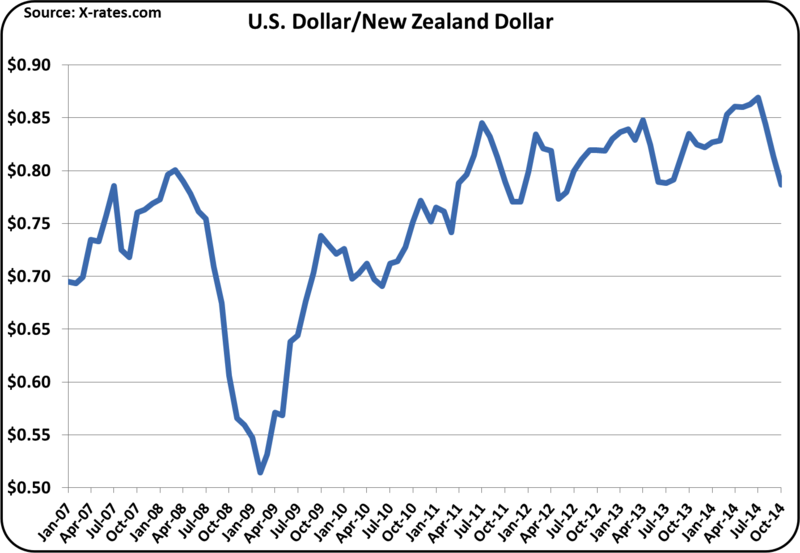 On the charts below, the USD is getting stronger against both the Euro and the NZD. Europe and New Zealand are the two biggest dairy exporters, and both export more than the U.S. This is where the competition for U.S. dairy exports comes from. 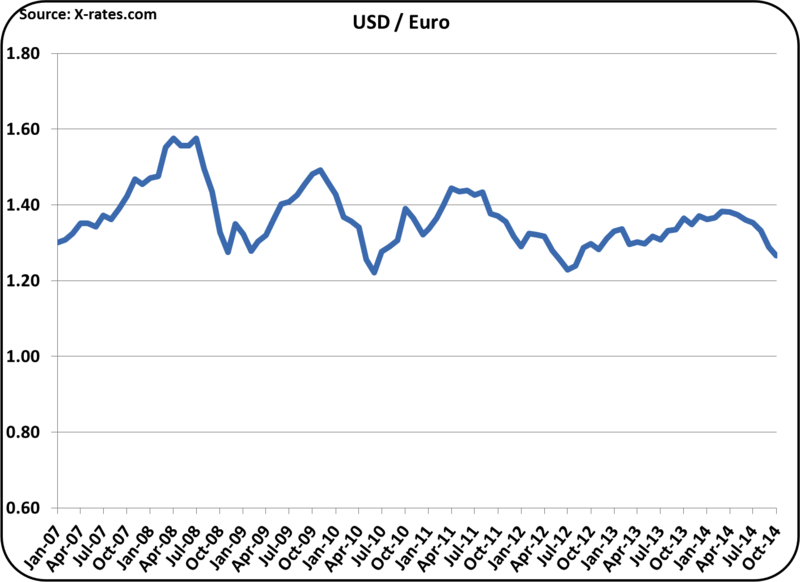 During 2014, the USD has strengthened by nearly 10%. If the USD gets even stronger, it will force the U.S. exporters to reduce pricing and/or lose volume. 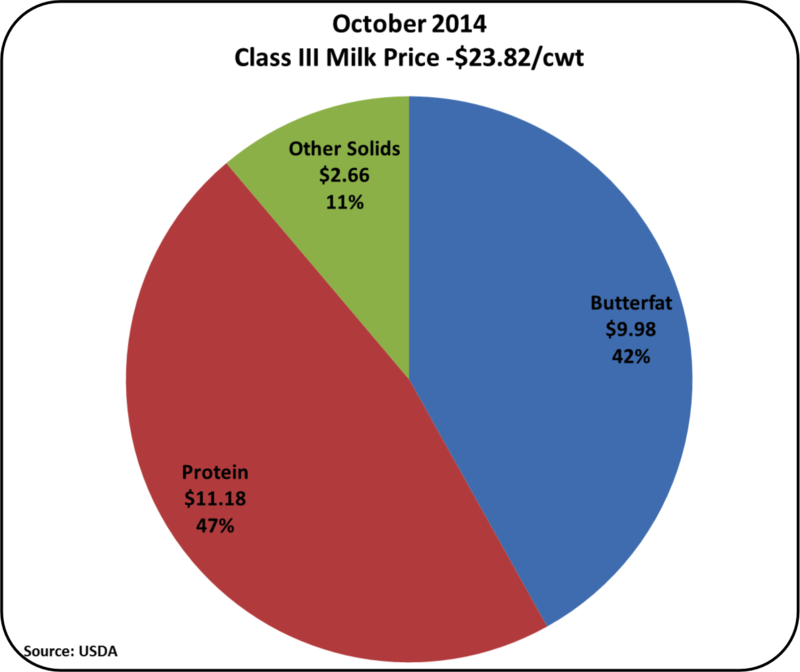 The futures market for Class III milk indicates a weakness in the coming months, with prices falling to the $17/cwt. area. This will only happen if cheese exports fall and inventories rise. While this could happen, with aggressive pricing in the international markets, there is also a good chance that exports and cheese pricing will remain healthy.